"Fantasy is a creation of the Enlightenment and the recognition that excitement and wonder can be found in imagining impossible things. From the ghost stories of the Gothic to the zombies and vampires of twenty-first-century popular literature, from Mrs Radcliffe to Ms Rowling, the fantastic has been popular with readers. Since Tolkien and his many imitators, however, it has become a major publishing phenomenon. 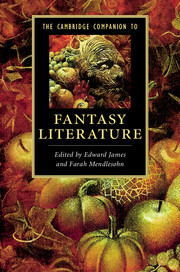 In this volume, critics and authors of fantasy look at the history of fantasy since the Enlightenment, introduce readers to some of the different codes for the reading and understanding of fantasy and examine some of the many varieties and subgenres of fantasy; from magical realism at the more literary end of the genre, to paranormal romance at the more popular end. The book is edited by the same pair who edited The Cambridge Companion to Science Fiction (winner of a Hugo Award in 2005)"- Besedilo s hrbta knj.